In today’s post, Professor Catherine Needham argues that low tolerance for public servants to test new ways of working is hampering meaningful change in the way government works with citizens. This post was originally published on the 21st Century Public Servant blog. As the portion of Australia’s older population continues to grow, there is increasing focus in policy on issues pertaining to ageing, demonstrated most recently in the Liberal Budget papers. However, much of these policies appear to be designed with little input from those who are struggling most to age well – older women. In today’s election series piece, co-authors Susan Feldman and Harriet Radermacher provide a summary of their recently-published research in which they heard from older women in the greater Melbourne area on issues of importance to them. With the Coalition’s ‘woman problem’, representation of women in Australia’s Parliament has been at the forefront. While Labor has a self-imposed gender quota (see page 6) that means women are at near-parity in Parliamentary representation at 46.3 per cent, the Liberals are at 22.9 per cent (percentages calculated in January 2019). With an overall female representation in Parliament of 33.2 per cent, here’s the question: does representation matter? One way to answer this is to look to countries which have a quota system, to identify any changes to policymaking. In today's analysis, Quentin Lippmann of the Paris School of Economics provides evidence from France. This summary draws on Quentin’s presentation at the Australian Gender Economics Workshop in February of this year; his full presentation notes can be found here. Krystian Seibert is an Industry Fellow at the Centre for Social Impact, Swinburne University of Technology. In this cross-post from The Conversation, Krystian argues that we will soon witness the largest inter-generational transfer of wealth we’ve ever seen. However, evidence suggests that charities may miss out. In this article, we learn how much we give to charity each year, how philanthropic activity can be structured in different ways for different purposes, and what needs to happen in order to drive the growth of giving. Hidden away amongst supplemental papers to the recently-released Coalition budget papers is a line item for $10 million earmarked to support counselling for families experiencing domestic violence. 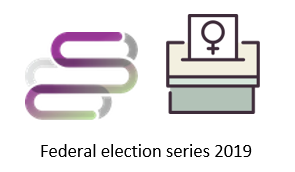 In today’s election platform analysis, Hayley Foster (@HayleyFoster82) of Women’s Domestic Violence Court Advocacy Service NSW (@wdvcasnsw) explains why this funding goes against both the evidence base and the recommendations from the domestic and family violence service sector. This piece is adapted from a media statement that WDVCAS NSW recently released, which can be viewed here. Our budget coverage continues! Ahead of the ‘National Integrity Forum’ on 8 April at Parliament House, Dia J Andrews (@DiaJAndrews1) of the Public Service Research Group, UNSW Canberra takes a look at the state of play in the federal anti-corruption space in the lead-up to the 2019 Federal Election. What have each of the major parties promised, and what do the experts recommend?